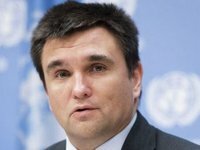 Minister of Foreign Affairs of Ukraine Pavlo Klimkin has arrived in Berlin, where a meeting of the Foreign Ministers in the Normandy format is to be held on Monday, Ukraine's ambassador to Germany Andriy Melnyk has said. "Welcome in Berlin, Mr. Minister PavloKlimkin! It is your 30th visit to Germany! Looking forward to a successful Normandy Ministerial Meeting," he wrote on Twitter. He illustrated his post with a photograph of the meeting with Klimkin at the airport.